If you add a file with an unknown file extension to a project, you are asked to specify the file type. You may select Custom File, and use a custom translator to process this file. The custom translator is specified, along with its command line, in the Custom Arguments field of the Options for File... — Properties dialog. Typically, the custom translator will generate a source file from the custom file. You need to add this source file to your project, and use the Assembler or Compiler to generate an object file that can be linked to your application. 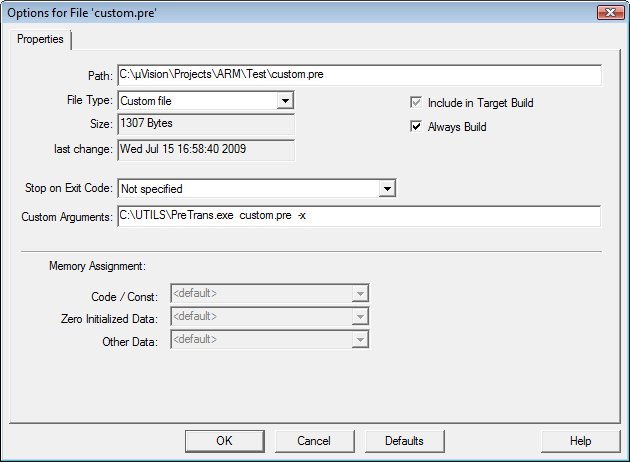 In this example, the program C:\UTILS\PreTrans.exe is used for custom.pre with the parameter –X to translate the file. Set Folder and File Extensions to define default file extensions.